Locking snap-off blade knives are available in both light-weight and heavy-weight versions and are perfect for use on a wide variety of materials. Use the light-weight knife for cutting paper, boards, textiles, leather, rubber and vinyl. The heavy-weight knife is suitable for cutting on almost any material: boards, textiles, wire, some metals, leather, plastic, rubber, vinyl, rope and more. The carbon steel segmented blade allows dull edges to be snapped-off as needed, revealing a fresh sharp edge. Blade length is adjustable and can be locked in position to prevent slipping. The light-duty blade has 13 segments and the heavy-duty blade has 8 segments. 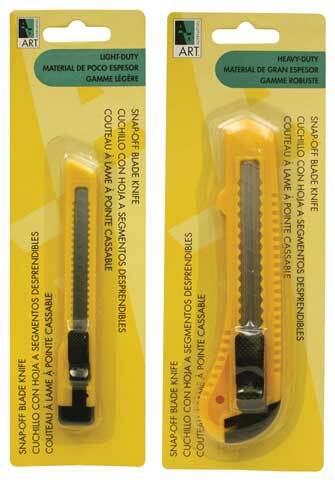 Replacement blades are available in re-usable plastic cases of 5 each (AA17985 and AA17986).